As Modi’s interview with the great Arnab Goswami is now over (dubbed as the biggest interview of this election season), one can safely assume that there’ll be no more TV interviews by Modi before the last phase of the polls. 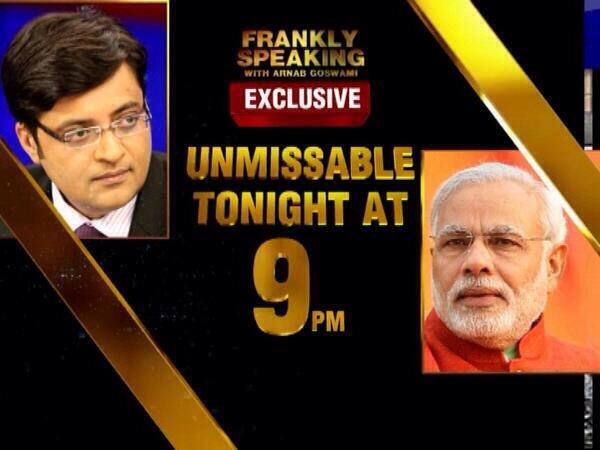 It seems CNN IBN and NDTV have been royally snubbed by Modi as they could manage to get only Amit Shah for interview. Anyways, now that all of the Modi’s TV appearances are over, here are some quick general observations on the TV interviews in which the BJP PM nominee appeared. 1. From that infamous Karan Thappar interview to the Arnab Goswami interview aired today, this is part of the Narendra Modi transformation story. While the Karan Thappar interview was a PR disaster, Modi has intelligently used his resources and has gained reputation in the public perception. 2. Modi has also successfully defeated earlier assertions from ‘Modi doesn’t take questions’ to ‘Modi doesn’t take tough questions’ to ‘Modi doesn’t take questions from popular journalists’. 3. Modi understood a very important fact that regional media has more reach than the national media and in the national media, Hindi media has more influence than the English media. Accordingly, the wise CM of Gujarat first appeared on regional language TV channels like ETV & TV9 then on Hindi language channels like India TV, Zee News, ABP News, Doordarshan and Aaj Tak and in the end on one English news channel Times Now. No points for guessing why Times Now. 4. Modi chose the time of his TV appearances carefully. All his major interviews were just before each phase of elections. 5. The interviews helped a lot as it not only let the people of India know Modi from close quarters, but it also helped Modi to clarify his stands on several major issues. He, sure, deflected many questions (many of them were loaded) but also answered several questions with answers that showed his clarity of thought. 6. Narendra Modi’s disdain for the mainstream media was clear from his interviews. In the process, he also coined a term ‘Newstraders’ which will be lapped up by his followers in the social media. Here’s the 3 best and worst pre poll TV interviews by Modi based in my view. I would love to know your views on this. Please share in the comments. Why: Fanboy interviewer, fanboy audience, fanboy interview. More focus on getting the credit for bringing Modi on the TV than asking tough questions. PS: As I am writing this quick post on my iPad, I haven’t embedded the YouTube videos of the interview. I will update them with time.